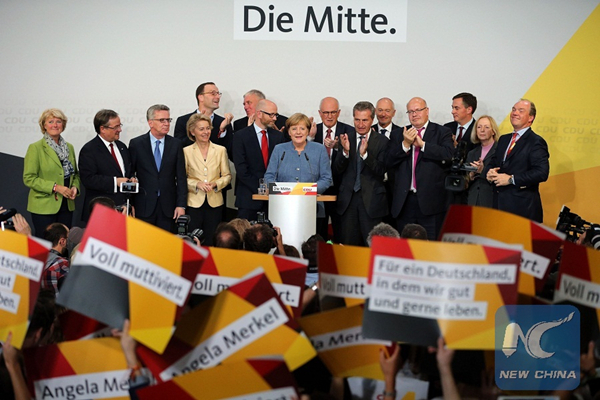 The German elections held on September 24 returned Chancellor Angela Merkel's Christian Democratic Party (CDU/CSU) to power as expected, but with only 32.9 percent of the vote, down 8.6 percent on 2013. It was a somewhat Pyrrhic victory. The coalition partner since 2013, the Social Democratic Party (SDP), won 20.5 percent of the vote, down 5.2 percent. In fact, these parties that incarnate postwar German political stability, suffered their worst showing since 1949. An even bigger shock was the advance of the far-right Alternative for Germany (AfD), an anti-immigrant, ultra-nationalist, anti-Muslim party polling 12.6 percent of the vote, compared to 4.7 percent in its first appearance in 2013. This is the first time since 1945 that a far-right party will enter the German parliament (Bundestag). The other victor on the day was the neoliberal Free Democrats (FDP), who won 10.7 percent, up 4.8 percent. Meanwhile the Left Party scored 9.2 percent and the Greens 8.9 percent, both marginal gains. These results revive two age-old questions that haunt Germany. If the vote affects German stability, how will this affect the world? And can Europe survive such a major political shift? Since World War II, German capitalism has weathered much turbulence, stress and strain, yet its political system seemed to have mastered the art of reproducing stability. German politics rests on a robust and diverse manufacturing economy. However, it is 50 percent dependent on exports, half of which go to other member states of the European Union. This explains Chancellor Merkel constant championing the EU, and her advocacy of "internationalism," which many hail a sane alternative to Donald Trump's "America first" agenda. Germany's rightward shift poses problems for France's new President Emanuel Macron. His enthusiasm for Europe won over the French electorate earlier this year, but he needs the new German government to sign up to his mission of political and economic reform; otherwise, he becomes the "emperor with no clothes." Merkel's own ruling party is composed of the Christian Democratic Party (CDU) and its Bavarian sister party, the Christian Social Union (CSU). However, the leader of the latter, Horst Seehofer, is opposed to Merkel's open-door asylum policies and wants the alliance to outface the right to halt the hemorrhage of voters to the AfD. A likely new coalition partner is the Free Democratic Party. However, it is opposed to Macron and Merkel's ambition to ameliorate some of the economic hardship in southern Europe. For example, at present, the European Central Bank is helping contain the Italian debt crisis. Should that policy change, it could rapidly escalate into a European and world crisis. So, unless Merkel can convince her coalition partners, otherwise, Macron's plans for EU reform will be dead in the water. Therefore, the German election result brings fresh doubts to the EU's future. It is true that the AfD is a splintered party. Indeed, Frauke Petry, its joint chair, resigned the day after the election and now will sit in parliament as an independent. Also, the AfD does not have any established party apparatus, and many of its voters cast their vote as a protest against the establishment parties. However, sometimes context is everything. Stability in Germany is not simply an aspiration, it is the primary state objective. Everything is designed to avoid the turmoil of 1918-1945, when Germany's political and economic crisis led to Adolf Hitler and a war, costing tens of millions of lives and devastating the continent. Immigration has taken center stage with the arrival of two million refugees over the past two years. Now, the anti-immigrant AfD is the third-largest party in the Bundestag. It is the same phenomena that developed in France (National Front), the U.K. (UKIP), and Italy (La Liga), representing a breakdown of the European status quo. Nationalism resonates with sections of the poor, with unorganized workers, small business owners, and the self-employed. It offers a sense of identity for them to cling to, and a channel to vent frustration at their own powerlessness. The AfD's vote increased most dramatically in Eastern Germany -- where refugee placement is relatively low. Here, many people fear refugees, and associate them with "Islamic terrorism." This compounds their sense of alienation from the "political class," a sentiment that has festered ever since German Unification in 1990. Over the last 20 years, the SPD and CDU introduced labor reforms that drove a sizeable part of the workforce into low wages and temporary contracts. About a quarter of the workforce earn less than two-thirds of the median wage. Fear of unemployment and the threat of businesses relocating pressured German workers to accept meager wage increases while profits soared. Real wages fell, and are now below the level of 1999. Meanwhile, GDP per capita has risen nearly 30 percent. If the SPD were to shift to the left and enter agreements on programs and policies with the Left Party; this could reassert the workers' interests and would result in a welcome shift in the balance of power between the classes. The German capitalist model created what is probably the most successful economy in the world, but that has been undermined by the 2008 financial crisis. Germany is the most populous state in the EU and its economic powerhouse, accounting for over 20 percent of GDP. Manufacturing accounts for 23 percent of the German economy and employs 19 percent of its workforce, nearly twice the proportion in the United States or the United Kingdom. Now it's beginning to struggle both politically and economically, and that's a worry. The recent German election raises many concerns about the country's political and economic stability, a worry not only for the EU but far beyond.